Happy St. Joseph’s Day! And to my dad, Happy Italian Father’s Day! Perhaps you’re confused. That’s OK. You can read all about the Festa di San Giuseppe in last year’s post: Fava Beans and Cream Puffs. There you’ll also find a photo of my great-great-grandfather a.k.a. the reason I ended up in my charming village. Auguri Papù and to all Josephs, Giuseppes, and dads out there! Also to Giuseppinas, Josephines, and any others celebrating! Also, if some of you happen to remember St. Joseph’s Day altars from childhood but are missing them right about now, check out this Virtual St. Joseph’s Day Altar. If you don’t have any idea what I’m talking about, read about this tradition. Now . . . it’s time for zeppole. Or as we say around here, zippoli. So, in that vein, some of you know zeppole as cream puffs, but there ain’t no cream in the Calabrian version. In fact, there are anchovies. How’s that for una sorpresa if you’re expecting cream? I have a very vague memory of my grandmother [perhaps] making these with anchovies when I was small, but the ones I remember best were simply coated in sugar while they were still hot. Ah . . . zeppole memories . . . Waiting patiently at my grandmother’s hip (seriously I was that high, or low I should say as she was under 5 feet tall) for these to cool down ever so slightly to dig in. She never got even near a platter-full before one batch was already gone. They’re that good. Unfortunately for my recipe repertoire though, my grandmother didn’t make her own dough in her later years when kneading wasn’t possible; she always bought fresh dough from the *best* local pizzeria and bakery. Indeed, she’d pick up the dough early Friday morning (during Lent especially), make pizzas throughout the day and then fry these babies up just as we were finishing up on the pizza. I cannot tell you how much I miss walking into that house on Friday afternoons after school. MAMMA MIA . . . CHE PROFUMO! (1) P’s mom; (2) my friend Alida from nearby Isca sull’Ionio who I met in Philadelphia (she brought homemade biscotti to our first in-person meeting! ); and (3) my dear friend Mary Amabile Palmer’s cookbook Cucina di Calabria: Treasured Recipes and Family Traditions from Southern Italy. Between these wonderful women (grazie mille! ), I am tasting exactly what I remember swiping off paper towels as a child. And now you can enjoy them too. 1. Dissolve yeast in 1/4 cup of warm water. 2. Put salt and flour in a mound on your working space, a wooden board if possible, although I use something like this like my grandmother used. 3. Make a well in the center and gradually add the dissolved yeast, remaining water, and wine pulling flour into the liquid as you go. 4. Knead for between 5 and 10 minutes until the dough is smooth, elastic, and “bella morbida” as my suocera kept saying–quite soft. If you’re used to making pizza, you may have recognized these ingredients; just make sure the dough here is softer than for pizza. 5. Put dough ball in oiled bowl, cover it with a towel, and put in a dry, warm place to rise for about 2 hours. 6. After the dough has doubled in size, take it out, and knead it for another few minutes. Then put it back in the bowl and allow it to rise again for another couple hours. This will make for fluffier zeppole, but if you don’t have time, just let it rise once. They’ll still be good. 7. In the meantime, if you’re using anchovies, prepare them by removing them from their container and draining oil. Cut them in two pieces so that they will fit into a pocket of dough that will end up being about the size of the palm of your hand once folded over. 8. Heat oil over medium heat. 9. Pull off small chunks of dough about golf-ball size, flatten, and stretch into a rectangle. Place anchovy or two inside and fold over, sealing edges well. If you’re making the plain version, simply stretch to dough to the size of the palm of your hand. 10. Fry in hot oil for 3 to 4 minutes, turning zeppole so they are lightly brown all sides. 11. Remove from oil with slotted spoon and place on paper towels to drain. 12. If you are making them without anchovies, dust them with sugar while they’re still hot–and if you’re like me and actually like the anchovy-filled ones with sugar as well (ssh–they think I’m very weird here for this), go right ahead! Note you can also fill these with lots of other things. Raisins, for example, are delicious inside and then I recommend dusting with confectioner’s sugar. I have great memories of eating zeppole as a child. My Mom would roll them in powdered sugar after they cooled off slightly. YUM! Hmm…I just assumed the Giuseppinas and Josephines have their own saint day. No? What a rip-off. Hmm yes we enjoyed our festivities with all my mothers yummy cooking on Sunday. It will always will be a fond memory for me. There is a link on my blog if you would like to see my Mothers alter. Vee’s last blog post..No News…. I am sure I’d love the anchovy version! Oh and anchovies here are *so* good! I never even liked the things in the US, but here…YUM. Hmmm…anchovies huh? You know, they get a bad rep, but with the way my tastes have “Matured”, I’m sure I’d actually like them now if I tried them. By the way, today I finally posted some answers to questions some of my readers asked WAY back, including one you asked. Stop on by if you get a chance! Oh, you have brought me back to my childhood! While my parents didn’t celebrate St. Joseph’s Day, they would still make these with Zeppole all the time. I can remember waking up on a Sat morning to the smell of the dough frying, and running downstairs to try to get a hot one. Truly a pleasure–glad they’re good memories…and oh that smell…. My Giuseppe’s mum made these when I was in his village in Calabria, but she used sugar as I love sweet things and don’t eat anchoives… And so bad of me but I forgot it was San Giuseppe today, until MY Giuseppe took me out for for a coffee and cornetto and I saw a sign in the window…I think he took me there just so I could see the sign! Hah! They’re crafty those Giuseppes…. I used to love zeppole at festas in NYC growing up! The type I had didn’t have cream, either – just fried dough rolled in sugar. As I’m a HUGE fan of anchovies, however, I can’t wait to try these. Thank you! And happy Italian Father’s Day to your Papa! Lucky you–you were around Calabrians 😉 And the anchovies really work wonderfully inside them–great appetizer! Great recipe! I think they call them “frittelle” here in Milan. But anchovies and sugar?????? Well, I guess I shouldn’t talk since I love eating macaroni and cheese with plain yogurt and salt. Now that’s weird. I’m big into the sweet and salty thing, what can I say? Chocolate and chips or french fries. Ice cream and pretzels. I’ve never tried that mac and cheese combo though…hmm…. Oh and yes, these have different names as well as different methods; I just found this page with some recipes for zeppole, sfinci, and frittelle…and the zeppole have butter and eggs…so different than these. The frittelle on there have rice; are these as you know them? I have never heard of St. Joseph’s Day, but those look mighty tasty… Not so sure about the anchovies, but I’ll take your word for it. Ah, we cheated then today…we had them from the bakery – with cream and a deep red CHERRY. That’s how we had them last year, too. Maybe my “crafty Giuseppes” just like sweets a bit more! BTW – try them with the cream and cherry. I’m sure they are a different taste, but a good one all the same! Fantastic, Michelle! My grandma made these too, (even though she was from Frosinone). I haven’t had them since I was little. This is too funny. I’m hoping to post about St. Joseph’s Day later today. My brother is a Giuseppe and my aunt is a Giuseppa! We made the cream puff, pastry version of the zeppole. I’m waiting to fill them right before dinner so they don’t get soggy! Looking forward to your post Susan! I love cream puffs too…mmm…. Michelle, I have a little gift for you today over at my blog. Enjoy! Yes, yes, yes, yes. Ever since I saw the pics on Flickr I have been salivating. I simply adore zeppole, and this looks like a fine specimen of the wonderful carbohydratey treat! zeppoli should have cream *or* anchovies in ’em. just dough, dough and more dough, covered in sugar. there are few things in the world i love more than zeppoli. 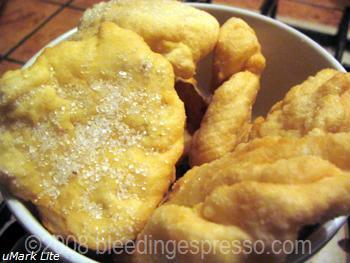 My mother always makes “SPINGI” or how you say “Zeppoli” every year for St. Joseph’s Day. I liked to eat them hot out of the fryer dipped in honey or sugar. Honey was actually a treat back then. My mom is actually making them right now as I write this blog and as soon as I get home from work, I’m going straight to my sister’s to pig out! Thank you for the wonderful post. I’m so hungry right now! A new twist for me, sounds great. my wife does something similar Nutella. In fact, she simplified it to a quick snack using won-on dough. I know, not the same. However I must try your recipe, thank you. Anchovies and confectioner’s sugar… hmmm. I wouldn’t have thought of that combination myself. But this recipe sort of reminds me of a more pungent version of a middle eastern pastry (bastilla?) stuffed with spiced ground chicken and likewise topped with confectioner’s sugar. I like anchovies; this sounds interesting. Oh, they sound delicious! I’ll take mine dusted with sugar. I’ve got a big sweet tooth. Thanks for sharing! And thanks so much for your help on blog feeds! Who cares about our butts, let’s just fry the dough shall we. Hold the anchovies and pass the sugar. It’s been one of those days. Yes! That’s the spirit…although I’m sorry it’s been one of those days. I hate those. You’ve got me thinking about grandma big time. In her area fo the Amalfi Zeppoli were plain and stuffed with the cream. I’ve had them with anchovie too – yummeee. All this talk of zeppole and frittelle is making me hungry. The frittella recipe on your link called for rice, not like the ones I’ve had here. From what I found on internet, the rice frittelle seem to be Tuscan. Sometimes my mother-in-law adds chopped apples to the batter. Ok, gotta go! Time to raid the fridge for my midnight snack. OK, I could not resist……..I got home from work and what did I do…….I made dough…….then I fried it and covered it in azúcar glasé……….oh, what a little piece of Heaven. Funny thing about you calling zeppole, I was talking to a former co-worker Wednesday afternoon and she said she just ate part of a ‘zippoli’ that another co-worker had brought in. She is of Sicilian and Spanish heritage but most important an attorney like yourself! Crazy coincidence I guess? I hope you had your fill. All the different variations of Zeppole… Guess I’ll have to try them all! Hah, I like the way you think Jill! Ah, yes! My family’s tradition is much similar. We come from a small town outside of Messina, Fuimedinisi. The original recipe has been lost but my mother put one together that works well. We make a dough with raisins, fry them and roll in sugar. We make these instead because my family was too poor to make custard and thus would use scraps of bread dough to make them. I always loved this holiday because of it connection with my roots. Buona Festa di San Giuseppe! Oh my GAWD this is funny! I got to my sisters and they had gone out to the store with Nonna, my mom. So my daughter and I walked in and immediately went to the oven where I took out a whole pot of freshly made “SPINGI” fried dough. I started eating and dippiing into the honey they left on the table for me….then I stopped stuffing my face long enough to realize that they tasted different…they were whole wheat “SPINGI”! When my sister walked in on me with my cheeks were stuffed full of them. I then said “How could you make “SPINGI” out of whole wheat flour?” I looked at my mom with questioning sadness in my eyes! My mother was laughing, she replied “I told your sister this wasn’t proper!” My sister said “well at least they’re healthy!” My sister and mother told me to take them all home. Playing it safe, I left them behind…I didn’t want to turn into a “SPINGI”. My 10 year old daughter would not even try a whole wheat “SPINGI”…lol. Well today I welcomed my monthly friend and now know why I was stuffing my face with everything in site yesterday and all of last week. BUONA PASQUA! I am off until Tuesday! Oh dear. I’m sorry, but some things are just not meant to be healthy. Buona Pasqua! I’ve decided that I have to make the Zeppoles tonight. Probably plain…I can hardly wait! Wow! never imagined them as a savory! The ones we get in NYC are rolled in powdered sugar while they’re still hot… so baaaaad in the very best way! 🙂 I made some recently that called for ricotta– just delicious. Your recipe sound really wonderful– must try it next time I make them! If you like anchovies, I certainly recommend this as a way to enjoy them. Hope you like them! Ooh interesting. I’m sure my P would love them that way–he’s a salt fiend. Anchovies in Zeppole! What a great idea. I never had them like that, mostly the cream puff kind fo us. Yours look wonderful! Marie’s last blog post..VEGETALI ALLA MARIE!! Oh those look delicious! I love bread and then to fry it just means heaven. My grandmother used to make these too and my mother still makes them to this day!!! We also get them when we’re at the San Genarro Feast in Little Italy in NYC. Every September!! My step-father loves them with raisins. I like mine plain, with powdered sugar. OMG, I wish I had one now!!! Yum is right. Once I get them in my head, it’s hard to get them out without actually indulging…. I am loving all the recipes on your blog, Michelle! I found the stuffed baby eggplant recipe I was looking for and now these Zeppoles! My husband and his family were from a town on the sole of the foot of Calabria called Gioisa Ionica. They seem to put boiled riced potatoes in a lot of their stuffed foods, including the dough of their zeppoles, and use some semolina flour in their recipe too. They never sweeten theirs, it’s always plain or with anchovy in the middle, and they were long and twisted. They were always served on Christmas Eve as an appetizer. Pat, I’ve seen those zeppole elsewhere on the internet; I showed them to P and he said he’d never seen them–amazing how things change from just a few kilometers away! Up here I don’t think they use as much potatoes in things, or at least P’s mom doesn’t (and neither did my grandmother, other than gnocchi of course). So interesting! I told you last year that you made my day, because I kept seeing all these recipes for zeppole, and they were filled with cream and I remember eating them as a child stuffed with anchovies….so again, I thank you Michelle! It makes me smile everytime now that the mystery is solved! JennDZ_The Leftover Queen’s last blog post..Jam-Packed Post: Friends From Faraway, Birch Ice Cream Recipe and a New Foodie Blogroll Update! I have just made these with my 100%Calabrese mother in Townsville NQ, Australia, and I can guarantee you, that the potatoes have been neglected in your recipe. ah yes, I know some Calabrese from Cosenza area that insist on the addition of potatoes and they are just as yummy…you basically just add a cooked riced potato to the dough and proceed the same way. Another great post Michelle even though I am reading it a year later….We all have such fond memories of our nonna’s …we should really create a national nonna day in honor of these special woman that shaped all of our lives and created such wonderful memories (in our minds and mouths) You can bet I will be making Zeppole this christmas eve just 1 day away! !